Every year we have the privilege of hearing the two pipers that the British Embassy sends to Addis every year. Last year we heard them in the covered area, which was a bit on the loud side, so this year we would like to have a K-5 assembly in the large amphitheater. They will be coming this Wednesday, April 24th at 8:15. The performance should last about 30 minutes. Thanks so much. Och aye! Thank you, British Embassy. Made me wonder, though: where else do these pipers perform while they’re in Ethiopia? And is this what they do all year, visit homesick Scots at embassy outposts around the world? Or is this part of a mission to exchange the highland cultures of two continents? All my questions were answered at the assembly. 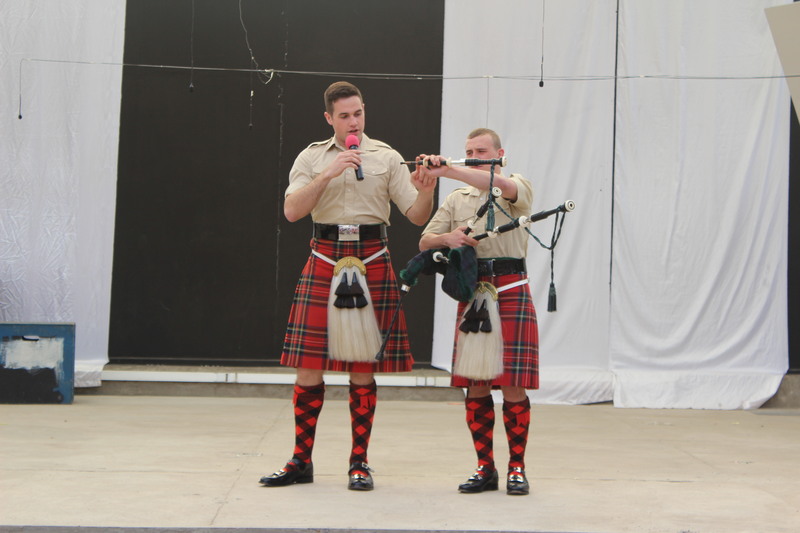 The pipers were brought in to perform at the UK embassy’s annual Queen’s birthday garden party (that would be her actual birthday – April 21 – as opposed to her official birthday, which is in June). The pipers are visiting schools while they are here. And they are part of the regular British army; piping is only a part of their duties. Their names are James and Jamie. I don’t know what the kids thought, but I can see how they might inspire a following. This entry was posted in Expat experience, International Community School. Bookmark the permalink.